As surely as Charlie O'Connell, #40 of the San Francisco Bay Area Bombers, and Joan Weston, #38 of the same team, skated their way into American living rooms in the 60's and 70's, the music of and about roller derby leaves an impression on the mind. Thanks to Drew Barrymore's directorial debut in the Ellen Page hickster-becomes-roller-derby- star movie Whip It, once again roller derby rises from its ashes to be reborn. 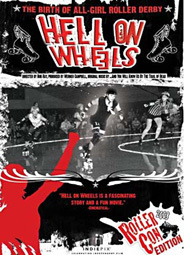 Also, thanks to that movie's predecessor, Hell on Wheels, a documentary about the Lonestar Rollergirls deep in the cardiovascular section of Texas who began an all-girl skating group, one sees the sport revive. Yet, the music involved with this sport clearly is being dug out from archives and new songs about going "round and around and around at the roller derby" (as one of the oldest TV songs about the sport declares) are finding their way to movie soundtracks. The music revolving around roller derby has different sociological, physiological, and philosophical aspects. First, roller derby songs have a sociological purpose of providing tributes to the generic athlete in the sport. Most of the songs have the titular words "Roller Derby Queen" as a reference point. The most familiar song used as a closing soundtrack to the Ann Calvello documentary, Demon of the Derby, comes from the late Jim Croce. Croce's "Queen of the Roller Derby" humorously details a casual viewer's glance at the sport on TV and the viewer becomes an intellectual groupie. The woman of his dreams is a "heavy duty woman" who is his "big blonde bomber" (no doubt a reference to the Bay Bombers – at least to Joan Weston's blonde hair). Leon Russell's "Queen of the Roller Derby" from an album appropriately called Carney became a secondary anthem – more of a description of a woman whose presence via her career is to be noted; she is what she skates. Neither Croce nor Russell hint at any disrespect of the woman (men don't seem to be the content of these songs for heterosexual prevalency In the hierarchy of mating); their insight is an acknowledgment of her craft. Even Alison Pipitone in her "Roller Derby Queen" (thank heavens for no copyright laws on song titles) gives reverential homage to the female star of quads and tracks. Secondly, there is a physiological emphasis in songs about roller derby. One of the most popular songs in this genre is "Roller Derby Saved My Soul" by Uncle Leon & the Alibis. The "soul salvation" comes not from a religious epiphany but from watching the physical aggressiveness of a female jammer. Even the "Go! Go! Go!" chant of the roller derby crowd enters this song as Uncle Leon's non-zen approach to the sport "…makes a grown man yell." The Young Moderns' "Roller Derby Queen" is a paean for the ability of a skater to be dexterous: "…Watch my knee/I know how to use it." Perhaps the most intense concentration on the physicality of this wheeled sport comes from downhome bluesman Meantone's EP Roller Derby Girls. Of course, the title track deals with the species in a general sense, describing the constant circularity of the performance by the girls; "Punchy'o Guts" focuses on the way blockers try to keep jammers from scoring. Revenge of the female skater enters into the scene with "Roxxy Retribution"; there seems to be a claim that female skaters hold grudges against other feminine skaters who cause trouble for them in a game. "Devil's Child" is the personification of many of the super-aggressive players whose showmanship draws a crowd. "Gee" appears in an instrumental mode; a bluesy number as the derby game concludes. Thirdly, a philosophical nature behind the sport develops in many of the songs. One notion exists that the choice to be a female roller derby participant is biologically predetermined. "Roller Derby Girl" by 900 Pound Gorilla has many lines beginning with "Some girls..." who are involved in various callings but "some girls" are just made for the derby. Many groups have songs with the same title – "Roller Derby Queen" – the Psychobilly Kadillaks (who sound like four Johnny Cashs recording for Sun Records); the Dead Popes whose punkish approach hails the natural choice of a woman to be a queen in the sport; T.T. Tucker and the Bum Rush Band invite listeners to view the royalty's (of the sport) status as predesigned. A second treatise in roller derby song philosophizing is the creation of a sitz-im-leben (setting in life) – that if the song refers to any element of roller derby, then the song becomes part of the genre. The philosophy among listeners to these songs is quite inclusivistic; for example, in the documentary, Blood on the Fast Track, a movie revolving around the creation and present-day existence of the Rat City Rollergirls, Roger Miller's old country song, "You Can't Rollerskate in a Buffalo Herd" gets included as relevant soundtrack music. "Jack of Speed" by Steely Dan is included in a playlist of roller derby songs (see http://www.fiql.com/playlists/roller_derby) when the song has nothing to do with roller derby at all. The same holds true for "Skateaway" by Dire Straits; the reference to the skater could range from a rollergirl to a waitress on skates but no clear mention of roller derby exists. Even "Too Fast for Love" by Motley Crue gets an honorable mention as a roller derby song but the song has no explicit reference to the sport. Evidently, some roller derby fans are so hungry for applicable music that the boundaries are extended too far. A third philosophical strain to be found in roller derby songs is that of creating a mode to express sexual shenanigans. Thus, roller derby becomes more like rock and roll - sexual expression. Leading the pack is Skidmore's spoken narrative "The Queen of the Roller Derby" and the play-by-play is not about a banked track but about a "goose egg Evelyn got" – a definitely prurient story. Following this misuse of roller derby to promote a rendezvous is De La Soul's 1991 single "A Rollerskating Jam named Saturday" which contains some skating terms but not in the context of an athletic contest. The most cryptic concept comes from Starcrost in "Roller Derby Star": "...you ain't no salad, baby, you're a Roller Derby star." With the rise of all-girl roller derby nationwide, there are songs about the sport that seem to be appearing in rabbit-like fashion. Who would have thought that a sport developed by Leo Seltzer in the 30's and made even more popular by son Jerry in the '60's and '70's would find new adherents looking for matching music? Even now, postmodernists put on their nostalgic roller skates and are getting ready to jam for points.